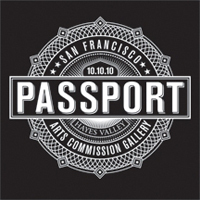 Passport 2010, on Sunday, October 10 from noon – 4 PM is presented by the SFAC Gallery is an affordable do-it-yourself art collecting experience. This annual public art event takes participants on a neighborhood stroll to collect artist-designed “passport stamps” in a special booklet that, once complete, becomes a limited-edition art book with original work by some of the Bay Area’s finest artists, both established and emerging. Passport 2010 Participating Artists: Timothy Cummings, Richard Diebenkorn (courtesy of the estate), Jamaica Dyer, Ana Teresa Fernandez, Suzanne Husky, Jason Jägel, Ruth Laskey, Paul Madonna, Nigel Poor, Ricardo Richey, Lordy Rodriguez, Jovi Schnell, Travis Somerville, Deth P. Sun, Weston Teruya, and Lindsey White. At the Passport 2010 Kick-Off Party, guests can pick up pre-purchased passport books or purchase passports at the door, enjoy drinks and live music, and enter to win raffle prizes from a range of exciting community partners. Passport 2009 artist, Sean McFarland will be running a photo booth, Passport 2010 artist Suzanne Husky will be hosting a video kissing booth for any and all willing participants. Music by DJ Nuxx, who was just voted best DJ by the San Francisco Bay Guardian. Visit favorite spots in Hayes Valley or discover new ones while collecting original stamps created by Bay Area artists for Passport 2010. Stop by Passport 2010 Home Base at Patricia’s Green to purchase a passport, pick up a map of locations, learn more about the SFAC Gallery, or relax and enjoy $1 hot dogs in the park with the whole family. To participate, art enthusiasts may purchase a Passport 2010 booklet for only $25 (a Moleskine® notebook donated by Chronicle Books that features a custom artist-designed cover) then follow a map to various Hayes Valley locations to get the book stamped by the artists themselves. Past “stamps” have been quite elaborate, sometimes involving hand-finished touches or performative elements. This year promises to bring similar surprises and attention to detail. Stamp locations in Hayes Valley will include Zonal, Rooky Records, MAC, Isotope Comics, and others. Proceeds from this fundraising event go toward the SFAC Gallery’s programming fund, which supports artist honoraria and exhibition costs throughout its entire season. Passport 2010 begins the evening of Saturday, October 9 with a Kick-Off Party at Rickshaw Stop, featuring passport pre-sales, live music, raffle, a full no-host bar, and many more surprises. The following day the event convenes at Patricia’s Green on Hayes Street at Octavia, which will serve as Passport 2010 Home Base between the hours of noon and 4pm. During that time participants can stop by to pick up a map, purchase a passport, or bring family and friends to relax on the lawn and enjoy a hot dog and soda while mingling with other Passport 2010 revelers. Passport can be purchased on line here, at the SFAC main gallery, at Rare Device, or at the Passport 2010 Kick-Off Party. On the day of the event passports may be purchased only at the Patricia’s Green Home Base. Only official Passport 2010 booklets will be eligible to receive stamps. Passports from 2009 may not be used for any Passport 2010 stamps. Passports are $25 and available online at eventbrite.com, during the kick-off party at Rickshaw Stop or at Passport 2010 Home Base on the day of the event. NEW – This year the Gallery will offer a Concierge Passport option. For $125 Gallery staff will collect all the stamps for you and mail the Passport to your home. Only 25 Concierge Passports will be available, so early purchase is suggested.